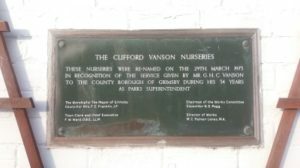 Green Futures is based at the Vanson Centre on Bradley Road, a former plant nursery which used to be North East Lincolnshire Council’s primary source of bedding plants and trees for its municipal planting and floral displays. Sadly though, a decade of disuse had seen this once vibrant place fall into a semi-derelict state. Green Futures took over the site in 2009, and with the support and hard work of staff and volunteers has worked to transform the site into an exciting and welcoming growing environment. In 2009 teams of local people worked to develop vegetable gardens, wildlife areas and an orchard among other projects, with the intention of bringing the land back to fruitful productivity. The core function of the site, 10 years later, is now the production of vegetables, fruit, trees, herbs and other plants, as well as providing a venue and focus for volunteering opportunities for local people. Green Futures markets produce that is generated on this site and sources fruit and vegetables from a local supplier to fill our veg boxes. By establishing a vegetable and fruit growing business that works with volunteers, Green Futures is playing its part in generally improving overall quality of life for people involved in the project. We believe that a range of beneficial activities which involve, empower and enable people in the wider community, particularly those who live in areas of social deprivation, will help to improve our collective quality of life.